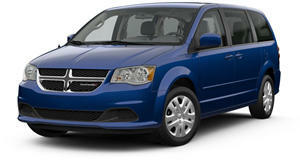 The Dodge Caravan proves all cars can be fun with the right mindset. The Dodge Caravan is the most unintentionally ironic car there is, and we’re going to miss it. It has a reputation for being as uncool as a pair of Crocs, but it has a lot more to it than meets the eye. Years of case studies into the American living room resulted in the unique travel experience that the Caravan offered. After all, it has everything you could think of to keep a car full of sugared-up toddlers occupied, and since it only costs $21,795, it’s cheaper than an 18 year Prozac prescription. It had power outlets, USB ports, enough storage space to make drug traffickers proud, the ability to taxi half a soccer team, and enough tech features to render you the “cool mom” until your kids are old enough to drive it. Luckily for us, owners picked up the lunacy where Dodge designers left off. Below are the best examples of owners showing off their Caravan love. You heard right, this mobile living room finishes the quarter mile faster than its Hellcat powered relatives. This car would be the ultimate sleeper if it weren't for the drama. Anyone betting against this car may want to take note of the jet engines that make use of the 142 cubic feet of cargo space. The most successful people in life make the best out of any situation. To maximize fun out of his mini-van, this guy pulls off one of the coolest commercials while reminding us just how cool a Caravan can be. If you’re a new father and need to justify trading in your pride and joy for kid-friendly transport, this will convince you that you’ll still have the time of your life. Once again, the Caravan got fed up with people questioning its athletic abilities and decided to show us what it’s made of. Turns out, whatever makes this people carrier tick is enough to outmaneuver an Audi R8 on a skid pad. Cadillac spent countless dollars to beat ze Germans, but they should have just asked Dodge. Even the first generations of the Caravan have fun built into their bones. Most people see a mini-van and think “boring family with a stable family and a slobbering dog.” However rednecks see potential for life ending and beer-infused fun. Watch as these guys take this mini-van for the ride of its life and discover that the Caravan is actually a great off-roader. We already saw someone try and make a sleeper out of a Caravan using jet engines, but this person actually tried to make his car discreet. You can't tell from the outside, but this car has a turbocharged engine capable of surprising passengers as well as making smoky getaways. See this driver do the ladder and sublimate his tires on the pavement.